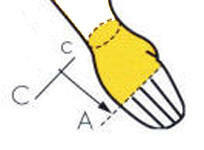 Measure your hand length from the line across you knuckles (A) to the wrist bone (C). Use the chart to determine if your hand length is Small or Medium. Gauntlet is only available in one length.